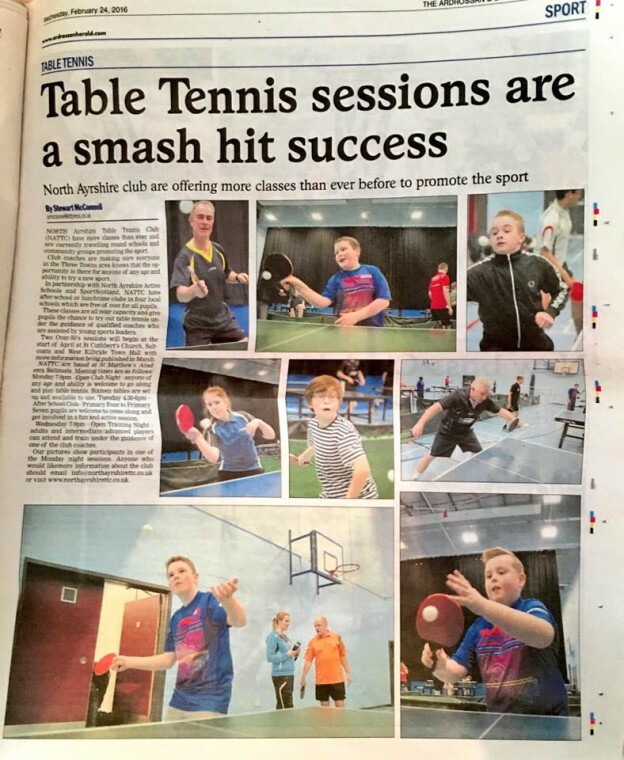 North Ayrshire Table Tennis Club have more classes than ever on at the start of 2016 and are currently travelling round schools & community groups promoting the sport of table tennis. Club coaches are making sure everyone in the three towns area knows that the opportunity is there for anyone of any age and ability, to come along to North Ayrshire Table Tennis Club and try a new sport. In partnership with North Ayrshire Active Schools & SportScotland, NATTC have after school clubs or lunch time clubs in four local schools which are free of cost for all pupils. These classes are all near capacity and give pupils the chance to try out table tennis under the guidance of qualified coaches & assisted by Young Sports Leaders . Two Over 50’s sessions will begin at the start of April at St Curthberts Church, Saltcoats & West Kilbride Town Hall with more information being published in March. North Ayrshire TTC are based at St Matthews Academy, Saltcoats and if anyone would like to come along to one of the sessions or would like to find out more information about our club please email info@northayrshirettc.co.uk. Monday 7pm – 9pm – Open Club Night – Anyone of any age and ability is welcome to come along and play table tennis. 16 tables are set up & available to use. Tuesday 4.30 – 6pm – After School Club – Primary 4 to Primary 7 pupils are welcome to come along and get involved in a fun & active session. Wednesday 7pm – 9pm – Open Training Night – Adults & intermediate / advanced players can attend and train under the guidance of one of our club coaches. This entry was posted in Latest News on 20th March 2016 by Chris Main.